Andrews McMeel Publishing, 9781449495145, 144pp. Gemma Troy spent her childhood hunting for gold with her father, camping in fern gullies, and collecting keepsakes from the outdoors. Pebbles, nests, shells, seed pods, plants, bones, feathers – if it’s beautiful, portable, and can be spared by the earth, Gemma takes it home as a reminder of nature’s beauty. 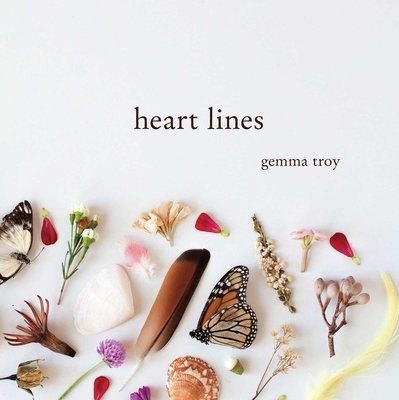 In Heart Lines, Gemma reflects on themes of love and pain, femininity and joy, and matches each delicate poem with one of her foraged treasures. Gemma Troy is a poet and artist living on the Sunshine Coast of Australia. She curates a collection of words and images that urges readers to slow down, look around, and be grateful for the simple things—the warm sun, the song of a bird, the budding flower.